Re-posting Ramon Ricker’s blog about Changing US Demographics and Classical Music in full, just because it can never be said enough! Here’s a personal observation and some thoughts. When my wife and I visited the Netherlands a couple of years ago we were fortunate, at Judy’s persistence, to get tickets to the Royal Concertgebouw Orchestra in Amsterdam. We started a couple of months early trying to book tickets online, but they were “sold out.” Knowing that tickets often get returned on the day of the performance, we went to the concert hall that afternoon and talked to the ticket people. They put our names on a list (we were first on it), and they told us to come back a half an hour before the start of the concert. Long story short, Judy charmed our way into the Queen’s seats. The Queen did not attend the concert that evening and the seats were made available at the last minute. I’m not kidding. We got them—the best seats in the house. (I don’t know why I’m setting the stage like this.) Anyway—It was their new conductor’s debut, (Mariss Jansons), and he did Mahler 6—the one with the hammer blows. The percussionist with the hammer must have made it himself. It was gigantic and beautifully made, all of wood. He picked it up like he had a Strad in his hands. Now, scroll over to US orchestras? In my mind it’s the same as the Amsterdam example. As I look out at the audience at a Rochester Philharmonic concert, the attendees don’t look the same as the general population of Rochester. I ask myself, “Why were US orchestras formed in the first place?” My guess is that the population was predominately of European descent at that time, and they probably wanted to experience or recreate the culture of their homeland. It felt natural to them. Thinking about the well-documented changing demographic of the US towards greater numbers of citizens with other than European (read: white) ancestry, I can’t believe that this population, in 50 years or probably less, will want to sit in a concert hall and listen to Mahler. It’s not in their DNA or culture. And that’s not a put down. They also don’t get exposure to this music in schools. If I keep going along this line of thinking, I don’t see a bright future for “classical” music in general or US orchestras in particular. Sure this music will be with us, but will professional musicians be able to make a living playing it? That’s already difficult to do today in all but the largest US cities. In order to maintain their competitive advantage, companies must spend time and money trying to envision the future, asking themselves questions like: Who will be our customers? Where will they live? Will they need our product? In what form should it be? Etc., etc. As musicians it is probably a good idea for us to do the same. If I were a young musician just graduating from music school and bent on a performing career, I would be asking myself these questions too. I would also be flexible and ready to take advantage of opportunities that may arise. When trying to envision the future, I am reminded of this quote that is attributed to hockey legend Wayne Gretzky. It’s a good one. When asked how he always seemed to be in the right place at the right time, and consequentially scored more goals than others, he replied, “I don’t go where the puck is. I go to where the puck will be.” Orchestras and musicians—maybe we should try to be like Gretzky. While reading the comments to a post by Drew McManus that I mentioned in my previous post, I came across a reference to a post that drew had written about the issue of having too many groups offering the same thing in a metropolitan area. While Drew disagrees than in general there may be too much of this redundancy (as he responded) he does think there are some areas, like the Northern Virginia/Washington DC area he talks about in the post I linked, that do have a problem. Drew seems to think it’s a dangerous idea for mergers, but at the same time he understands that in the case above that might actually help. Anne Midgette’s snapshot of the German orchestral crisis post-unification would suggest the same. Although I was glad to see that there weren’t any duplicates between the four ensembles, they do have remarkably similar programming (but I give Alexandria a few extra points for programming more new works than their sister ensembles). If you’re familiar with that area, you’ll also know that all four ensembles perform within eight miles of each other and two of them even perform in the same venue. Granted, Northern Virginia is a densely populated area but doesn’t it seem reasonable to think that four full orchestras performing similar works for essentially the same audience is simply too many notes? I have a different idea–what would happen if, say, one or more of these orchestras actually turned into a non-Western Orchestra? Or what if the re-structuring made it possible to actually provide full symphonic works that were so Eurocentric? For example, what if that Northern Virginia/DC area had, say, a full Arabic Orchestra, a full Chinese Orchestra, a full Mugham Orchestra in addition to the fourth full Symphony Orchestra? There certainly wouldn’t be any overlap of programming, nor any duplicate composers in just one art music tradition. I know, it’s a pipe dream–with the exception of special events American Orchestras don’t often program outside their 100 + year old niche of music from a region on this planet [Europe] that has less than a tenth of the world’s population. But I know I would be as excited, if not more excited to be able to hear a full orchestra perform the masterworks of Mohammed Abdul Wahhab, Fikret Amirov, or Lü Ji. I guess the question is, if Western Orchestras are having difficulties then how will the non-Western Orchestras fare? That’s what I’ve been trying to figure out and it is exciting to imagine the future! Right now, though–there aren’t too many notes or too few orchestras. Just not enough of the right balance of notes and orchestras. What does this have to do with music? Plenty. Music, popular and classical, is a potent cultural symbol, one that arouses visceral reactions as well as rational ones. It speaks to its listeners’ sense of place and history, and to deep-seated beliefs about the organization of communities and the perception of time. And many people like to think that the music they love is timeless, eternal, universally recognized as a pinnacle of human achievement – not a historically conditioned, minority preference in a big world. Part of the Eurocentrism battle has to do with whether the gamelan should be discussed alongside the orchestra, the talking drum alongside the tympani (and, perhaps, the telephone). Opponents of such a broadened curriculum raise the specter of students learning about the sitar instead of the violin, which no one is actually proposing. Still, defenders of the Western classical tradition, already feeling beleaguered by changing public tastes, now face credentialed colleagues who can point out that notated concert music is a relatively recent, relatively local phenomenon compared to age-old oral (and often improvisational) traditions of Asia, Africa and Latin America. For some people, Eurocentrism equals elitism, the determination to protect what’s best. In music, it’s not elitism – it’s just plain ignorance. The Eurocentrists ask, Where are the masterpieces outside the Western European tradition? And where are the composers whose music has survived the centuries? Those are trick questions, based on assumptions that are themselves Eurocentric. The Western European tradition treats music as something that resides in a tangible (and salable) artifact like a score or recording. But in other places and times, sometimes including our own, music has been more properly considered as sounds in the air, made to be heard once by an immediate audience – which might even participate, or dance. 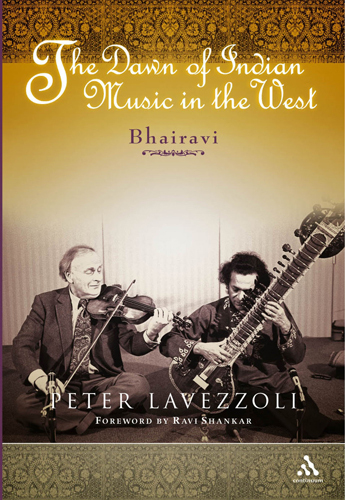 Peter Lavezzoli's book "The Dawn of Indian Music in the West: Bhairavi"
I think it really happened after the second World War, which was when people–especially Americans–became aware that there was another world outside of their own borders. Soldiers had been to Japan, Europe, and elsewhere. People went to Europe to study, Americans were living in Paris and London. That was happening all over the world, and right after World War II, and into the 1950s, the borders of the civilized world began to change very dramatically. At a certain point we began to talk about what Marshall McLuhan called the “global village.” This all eventually became part of the hippie generation and so on. 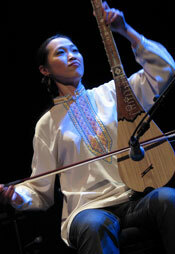 And it became clear that there were great traditions of concert music that existed outside of the West. An astonishing idea. [Laughs] They would be in Africa, Asia, Australian, or wherever else. But we really couldn’t call it concert music because there were no concert halls. You didn’t find concert halls in India when I went there in the late ’60s, they didn’t have them. People played in homes. The concert halls were eventually built when some of the technology of Western music found its way into non-Western traditions. Basically world music is now a fact. The fact is that an educated musician today would be foolish not to acquaint himself or herself with the traditions from all over the world. They can hide from it if they want to, but the reality is that it’s not just that we know it, but the audience knows it. It’s become a kind of parochialism to be confined to a Eurocentric tradition. So what we say is going to happen has already happened. Ravi [Shankar] was a very important part of that. He worked tirelessly at that, and was criticized in the beginning, when he was writing sitar concertos, playing with Menuhin, and so on. The video to the Menuhin/Shankar collaboration is in the previous post.